How much can the item grow relative to the rest of the flexible items when there is free space? When a user resizes the browser window for example? 0 (default), which means that items will not grow. Positive integers. The items will distribute across the newly gained space beyond their default width. How much will the flex item shrink relative to other items when there is not enough space in the parent element? When a user resizes the browser window or a new item is added, for example. 1 (default), which means that items will reduce their widths equally. This is the default width of the item (or default height when using flex-direction: column). auto (default) – the width is defined by the content, similar to width: auto. 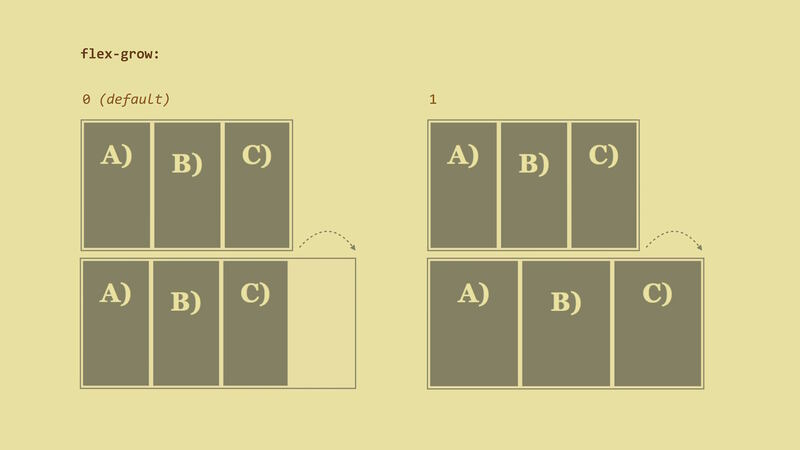 The distribution of free space using the flex-grow/flex-basis properties will then affect just the extra space that is taken up by items beyond their initial size - the so-called relative flex model. 0 – size of the content is not an issue. 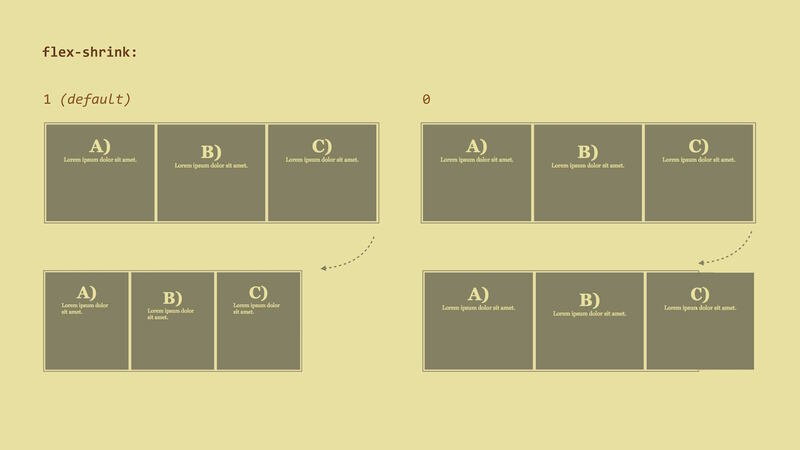 The distribution of free space using the flex-grow/flex-basis properties will then affect the whole width of the item – the absolute flex model. 100px, 15em, 50% - or any other CSS size. This is a shorthand for all properties that define the flexibility of an item: flex-grow, flex-shrink and flex-basis. It sets the default element size and tells us how an element can grow and shrink. It is good to know that the authors of the specification recommend using the flex shorthand rather than the particular properties which it represents. This is because the shorthand itself can set default values. flex-grow: 0 - the item will not expand to fill free space. flex-shrink: 1 - it will shrink just as all other items. flex-basis: auto - it will take up space defined by its own content. flex: auto This corresponds to flex: 1 1 auto. The items in question will become fully flexible, having a default width based on their contents. This is probably the most common case. flex: none This corresponds to flex: 0 0 auto. It cancels the flexibility of the item. This is the second most common case. flex: initial This resets values to the default, i.e. to flex: 0 1 auto. If there is not enough space, the items will shrink. However they will not expand beyond the size of their contents. flex: <positive-number> Watch out if you use a single number here! The flex: 1 declaration stands for flex: 1 1 0 so the default size of the item and flex model will be changed. I have already mentioned this in the flex-basis property section. 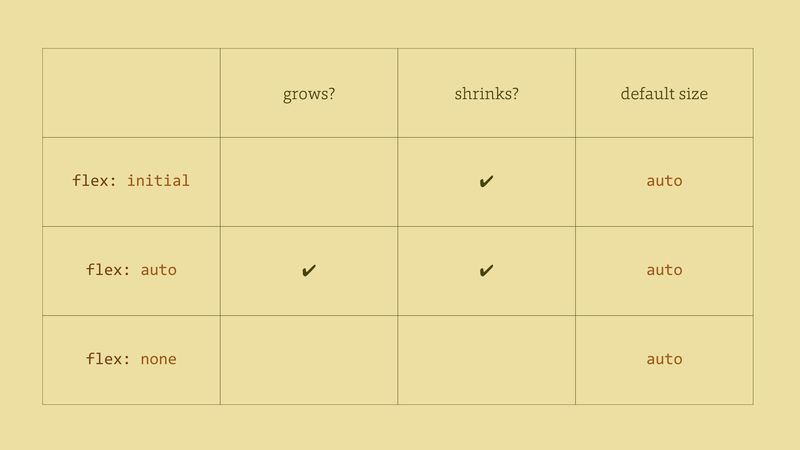 It is also good to know that flex items will never shrink below their minimum content size. This size is defined by the length of the longest word or fixed-size element – e.g. an image. It can be changed by setting the min-width or min-height properties to a low value. The order of flex items corresponds to the HTML code. However, we can change that using the order property. A change in the order affects the visual position of an element rendered by a browser. It does not affect the actual order of items, i.e. when using a document reader or going through the navigation using the Tab key. The default value is 0 which basically means that it will correspond to the “actual HTML order”. But remember that you can’t use order on other elements of the page except the direct children of the flex container. The margin: auto declaration works similarly to block elements. When calculating the size of flex items, the auto value does not matter. Free space is equally distributed among all margins. This allows you to set margin-left: auto, extending the left margin of an element with left margin and pinning the item to the right. You can use this instead of the float property. All other “alignment properties” use similar values, however they apply to different sets of flex items or different container axes. This property is applied to each item, so it is suitable for creating alignment exceptions. The default value is auto. Notice the alignment at the baseline of the first line. The item with the greatest size between the baseline and the upper edge (the topmost one) will be pinned to the upper edge of the flex container. You can see this in the previous image or at cdpn.io/e/QwobXz. 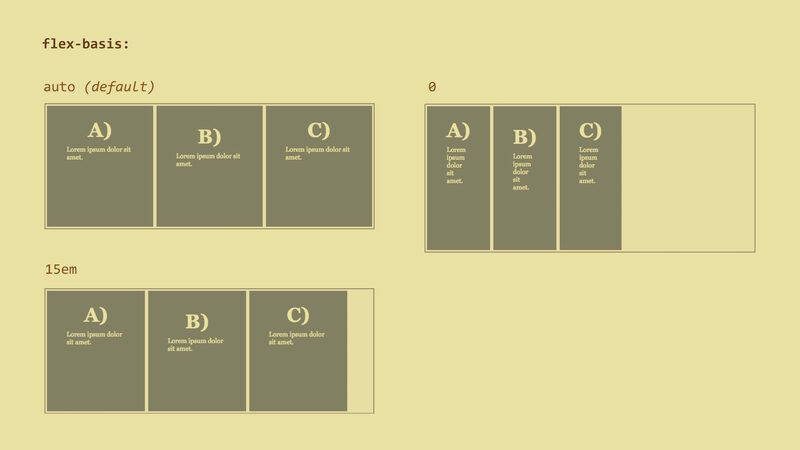 Note that flexbox will not corrupt the upper pixel padding.